The phrase ‘bulletproof coffee’ was termed by Dave Asprey, expert biohacker and productivity expert, who explored ways to optimize health and maximize efficiency and productivity. Bulletproof Coffee can also be called Keto/Ketogenic Coffee because it has been used by the low carb community as a way to kick start morning fat burning and train the body to run on ketones. When you’re in a carbohydrate-depleted or calorie-deficient state, your body turns to burning stored fat for fuel. When fat is broken down, ketones are released. Ketones can not only fuel every cell in your body, but more importantly, they can specifically fuel the brain. Releasing and using ketones for energy is known as ketosis. This leads to a fat burning and high energy state. So what’s in Bulletproof Coffee? Traditionally speaking, you would use premium, low toxin coffee and blend it with grass-fed butter. I, however, cannot tolerate caffeine and also am dairy free. 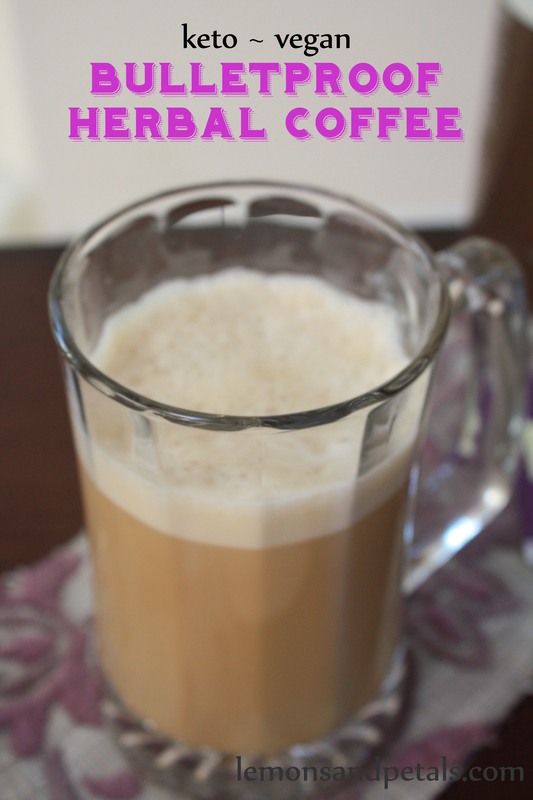 So I came up with something that works for me…..and it is sooooo delicious! I just had to share my recipe. But doesn’t it taste oily or slimy? Actually….no. Not at all. The blender part of this whole recipe is the most important part because it emulsifies the coconut oil into a smooth and silky texture that complements the coffee or tea. It is really tasty! But the best part is the fat burning boost from the coconut oil first thing in the morning. There are many flavors of Teecino. This recipe will work with any of them. Try them here.